Building Information Modeling allows smooth transfer of information between architects, engineers and others involved in the design and execution process. Architects can efficiently create, collaborate and share information within the design, engineering and construction industry through digital presentations of the design and building process. BluEntCAD’s BIM modeling services simplify the creation of models that serve as virtual representations of construction processes by matching each step with a frame-by-frame representation. Due to our expertise in modern software such as Autodesk Revit and Chief Architect, BluEntCAD creates integrated 3D-2D models so that architects, designers and other design professionals are rewarded with a faster, inter-operable and enriched design process experience. BluEntCAD’s BIM outsourcing modeling services ensure that quality is standardized and streamlined, and that risks, conflicts and errors are easily detected and removed. BluEnt’s expertise in BIM and architectural offshoring has enabled us to maintain competitive standards in the knowledge process offshoring industry. Forget your worries of training, staffing and recruiting, because BluEnt’s technically sound and qualified team is at your service anytime when your requirement arises. BluEnt has provided design support solutions to architects, interiors designers, builders and manufacturers around the world for over a decade. With experience and expertise, we have seamlessly integrated new processes and technologies into our work with commendable ease due to the knowledge and skill of our team. BIM outsourcing services from BluEntCAD supply you with critical information and competitive advantages by simplifying the availability of quality, integrated, reliable and coordinated information regarding design scope, scheduling and cost. With BIM technology the power, efficiency, and effectiveness of Information Technology can be harnessed in a value-added and powerful way instead of merely mimicking standard manual processes such as drafting. 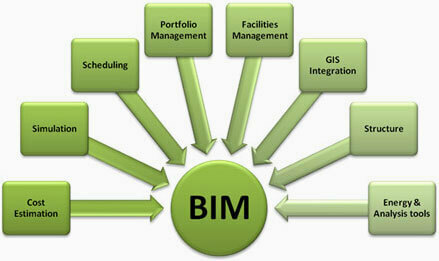 Tasks such as coordination, drafting, documentation, and scheduling are automated so that drawings representing a project are automatically modified.